Experience level. Intermediate. 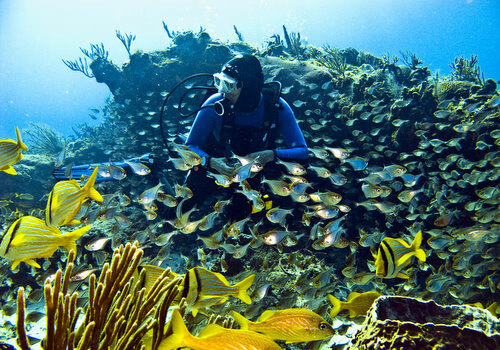 This Scuba Diving Caribbean is usually done as a second dive. It is about 5 minute boat ride north of Mr. Sancho's. Cozumel Tunich reef generally has a medium current, which encourages healthy Reefs of Cozumel and sponge growth. It is a low profile reef. Reef heads range from 10'-20' tall. There are an abundance of barrel and rope sponges. You will also see a lot of black feather hydroids, which are beautiful to look at but painful to get touched by. 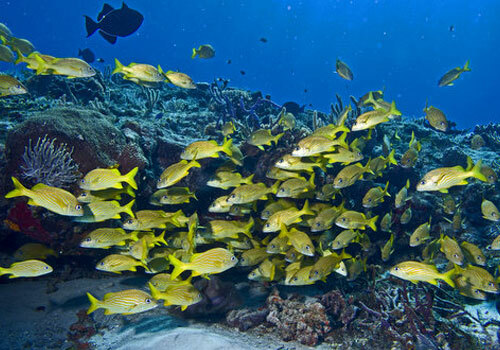 You will see large sloping hills of sponges and coral, which are inhabited by thousands of Damselfish, schools of grunts and snapper, and lots of cruising parrotfish and angelfish. For big life expect to see several turtles and possibly a nurse shark or two. 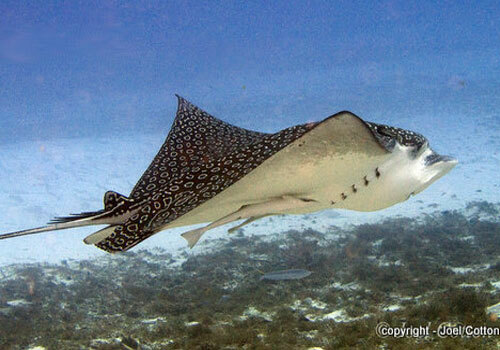 We haven't spotted many eagle rays here. Buy Coral Reef Guide to make your Cozumel Dive Trips more amazing and learn more. About 1/2 through the dive, you will run into coral heads with nice overhangs. Inside are schools of pork fish, schoolmasters, and French Grunts. Inside the overhangs, which form small caves, are Glassy Sweepers. 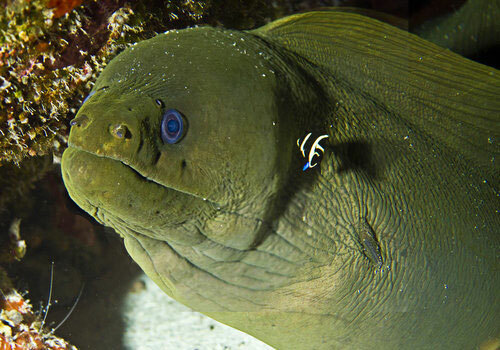 There is a big Green Moray eel in one of the most prominent overhangs. He comes and goes.